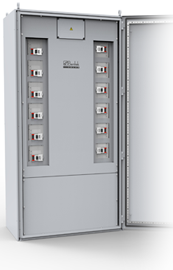 Bentek will introduce a new family of utility-scale (UTS) 1500VDC products with three products that all meet current NEC safety requirements. “Our customers continue to be faced with a market that demands continued price per watt reductions while maintaining compliance with all electrical code and product safety standards. Project owners and operators want to be assured that the products they are purchasing are 100% compatible with each together and with all other system components. 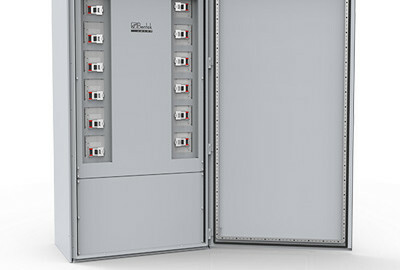 Our new 1500VDC products achieve all these objectives”, said John H. Buckley, Executive Sales and VP of Marketing. Bentek introduces its 2nd generation 1500VDC integrated disconnect string combiner. 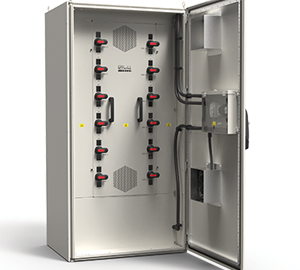 A custom range of load-break rated disconnect switches developed by Bentek for the 1500VDC UTS2 line vastly increases DC collection system design flexibility for project designers and EPCs. 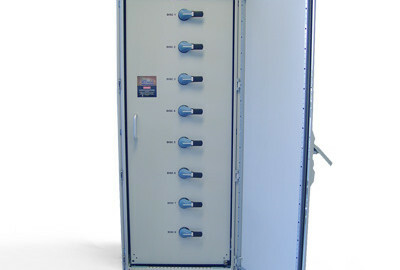 The new Bentek disconnects integrated in the 1500VDC UTS2 combiners are provided in standard commercially available ampacities of 200A, 250A, 320A and 400A. Bentek has expanded on this range to include ampacity ratings of 225A, 275A, 300A, 325A, 350A and 375A. The new Bentek 1500VDC UTS2 string combiners with expanded ampacity ratings are offered in one standard enclosure size with a variety of options including surge protection, pre-terminated cable whips, conduit fittings and mounting kits. “The more granular set of ratings will provide up-front value engineering opportunities during the design phase by not restricting customers to procuring “standard” ampacity units. This has the potential to reduce combiner costs by 10 to 15 percent with hundreds of thousands of dollars in project savings as a result” stated John H. Buckley, Executive Sales and VP of Marketing. Bentek’s highly configurable 1500VDC cable harness solutions complement the new 1500VDC UTS2 string combiner product line. Along with the standard single-circuit cable harnesses, Bentek also offers two-circuit paralleled cable assemblies. This allows Bentek customers to combine two source circuits in parallel thereby reducing installation and combiner costs by reducing the number of combiner inputs by half. “When complete cable harness assemblies are integrated directly with combiners in our ISO 9001 certified facility as part of a procurement order, combined materials savings of up to 20% can be realized with estimated project site labor savings of up to 40% due to reduced cable installation and wire management activity” stated John H. Buckley, Executive Sales and VP of Marketing. 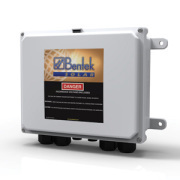 The Bentek Fused Disconnect Recombiner System (FDRS) is designed for Utility-Scale systems and is intended for close-coupled installation next to an inverter. 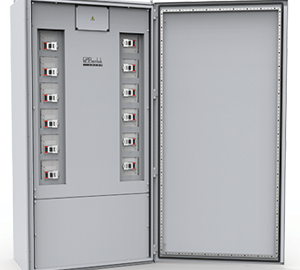 The FDRS provides multiple UL98B 1500VDC disconnects combined with 1500VDC PV fuses and Modbus current monitoring into one easy-to-install, compact enclosure. Bentek announces general availability of the Bentek NEC 2014 Rapid Shutdown and commercial three-phase inverter PowerRacks, PowerSkids and PowerShields. For more information about the capabilities on the Bentek Inverter PV PowerRacks and PowerSkids and PowerShields please contact Bentek at 1-866-505-0303 or visit www.BentekSolar.com. Bentek will exhibit in Booth #360 at Solar Power International (SPI), scheduled to take place Oct. 20-23, 2014 at the Las Vegas Convention Center in Las Vegas, Nevada. Bentek will introduce several new UL listed solutions that enable string inverter compliance with the NEC 2014 rapid shutdown requirements.Company representatives will showcase the following equipment: the Rapid Shutdown System (RSS), PowerRack and PowerShield, PowerSkid with integrated inverter, DC connection unit, and Bentek AC Disconnect and AC PowerBUSS. 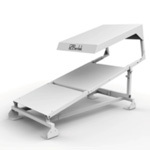 The Bentek RSS solution provides the PV marketplace with a universal design that is compitible with any inverter type. The PowerRack has been optimized for string inverters from ABB, Advanced Energy, Chint Power Systems, Fronius, Schneider, SMA, SolarMax and Solectria. The patent pending Bentek Residential and Commericial Rapid Shutdown System (RSS) is a complete stand-alone solution that is highly cost effective and easy to install. 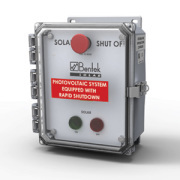 It includes two components; the Rapid Shutdown Controller (RSC) installed at the service entrance and a Rapid Shutdown Module (RSM) installed at the array. The Bentek PowerRack and PowerShield provide installers with an easy, cost effective way to install three-phase string inverters directly on flat commercial rooftops at the edge of the PV array, meeting the requirements of NEC 690.12. The Bentek PowerSkid is a PowerRack with fully integrated three-phase inverter, Bentek AC disconnect and other accessories. 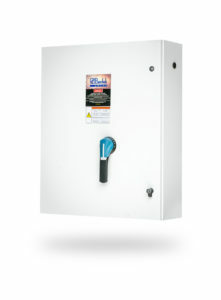 The Bentek AC PowerBUSS combines the AC output of three-phase string inverters and provides overcurrent protection and disconnecting means prior to the service panel. The AC PowerBUSS can be integrated with a Bentek PowerRack and installed on flat commericial rooftops next to the three-phase inverters. 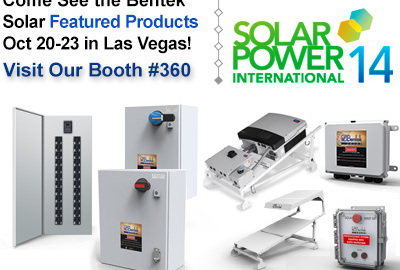 For more information about Bentek’s entire suite of PV solutions, stop by Booth #360 at SPI in Las Vegas, call Bentek at 1-866-505-0303 or visit www.Bentek.com. 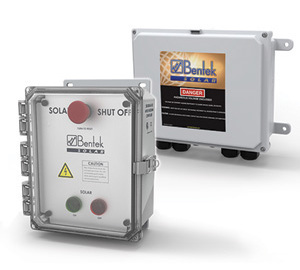 Bentek Solar, a leading designer and manufacturer of PV products connecting PV panels to inverters worldwide for the commercial and utility-scale marketplaces, announces that it has shipped more than 100MW of the new Breaker Universal Safety Systems (BUSS) since its recent March 2013 introduction.